COPENHAGEN, Denmark (26 May 2013) – It was a simple misunderstanding. Traveling with my friend and work colleague, Terri, it was my responsibility to handle all the business details on the 15-day European tour that would take us to 12 cities in three countries. Copenhagen was the first stop. It was Terri’s responsibility to take care of the fun—a perfect job for my free-spirited, adventurous friend. We arrived in Denmark's capital city, navigated the subway, talked our way out of a steep fine for not knowing about stamping our ticket (we played the we’re-from-Alabama-and-don’t-know-any-better card) and then quickly settled in to our teeny, tiny little hotel room. I got busy answering emails and confirming work appointments. Terri was busy researching, talking, studying the travel guides—excited about exploring the city and planning the fun. I vaguely remember that she mentioned Copenhagen, Crown Jewels, Christiana, Castles, King Christian, Christiansborg Palace…a lot of “C” words. We bolted out of the hotel room and took a quick two-block walk to the gorgeous harbor at Nyhavn. We quickly fell in love with Copenhagen! The lifestyle is cool—relaxed and carefree. The locals are completely engaged in the city and each other. It was a beautiful, sunny day. We took a quick boat tour to see the traditional city sites and then enjoyed just sitting in a sweet little café by the water, watching the big ships and talking to the friendly Danes. Most of the locals travel throughout the city on bicycles, and cyclists have the right of way. It is common to see men in business suits on their way to work…on bicycles with their briefcase sitting securely in the wicker basket attached to the handlebars. Women ride bikes in pencil skirts and high heels. It’s impressive. There is only one way to appropriately tour Copenhagen, we agreed—on a bicycle! We found a rental place just around the corner from our hotel. For the bargain price of about 80 U.S. dollars, we had two bikes, about 10 hours of daylight, and a whole new world to explore! Terri had the maps memorized and a complete fun agenda. As promised, I followed her lead. Now, remember, there were a lot of “C” words thrown around when Terri was planning and I wasn’t listening. Ok. Great! I’m right behind you! For some reason, in my distracted, jet-lagged brain, I was thinking this was the name of the castle where the crown jewels are stored and guarded. So in my mind, we were off to have tea with the Queen. Like I said…a simple misunderstanding. We peddled and peddled and peddled—enjoyed the sights and scenery and stopped at a few tourist spots along the way. But Terri was on a mission with a definite destination. She kept saying, “We are getting close.” But I noticed we were seemingly getting further and further from the city center. We went through several off-the-beaten-path, cobblestone streets that were no longer packed with locals or tourists. Terri was confidently peddling in front of me and looked like she knew what she was doing. So I continued to follow her. She’s in charge of fun! We parked our bikes and set out on foot. I was in a state of dazed confusion. A simple misunderstanding. Within a block or so, we seemingly stepped back in time and entered a whole new world. And through a figurative and literal fog, everything became clear. Christiania is a self-proclaimed autonomous neighborhood of about 84 acres and some 850 residents in the borough of Christianshavn. Civic authorities in Copenhagen regard Christiania as a large commune, but the area has a unique status in that it is regulated by a special law—the Christiania Law of 1989—which transfers parts of the supervision of the area from the municipality of Copenhagen to the state. Colorfully dressed characters sporting dreadlocks and torn jeans casually roam the commune in a happy, content, foggy haze. Every building, hut, warehouse, fence, old military barrack, mobile home and even the dumpsters are decorated in colorful murals and often-controversial graffiti. Did we somehow step into a time machine and get dropped in the middle of the 1969 Woodstock Festival? No, this is modern-day Freetown Christiana. There is no crime. There are no cars, so no traffic. No one yells or fights or screams. Everyone is happy. Seriously. Everyone. Happy. Really happy. It is pure serenity! We later would learn that the people in Christiania have developed their own set of rules, independent of the Danish government. The rules forbid stealing, violence, guns, knives, bulletproof vests, hard drugs and biker’s colors. In deep contrast to the site’s previous use as a military base, the spirit of Christiania is peaceful, communal and calm. It is a modern-day adaptation of the hippie movement and the squatter movement. It is governed by collectivism and anarchism. It’s just cool! 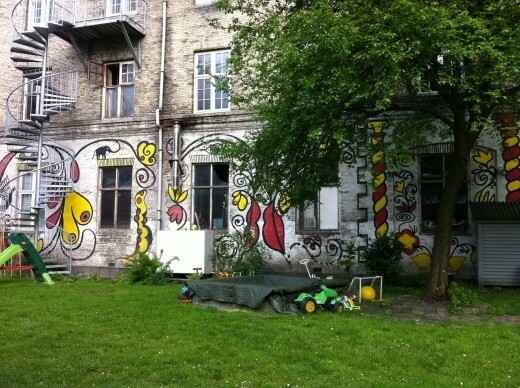 Many Danes consider Christiania a successful social experiment. For many years, the legal status of the region has been in limbo due to different Danish governments attempting to remove the Christianites. The attempts at removal have all been unsuccessful so far. I was wearing a preppy tennis skirt with coordinated top, a Northface jacket, color-coordinated tennis shoes and visor with neatly combed ponytail dangling from the back of my head. Terri was sporting a carefully coordinated Nike running set, very fancy camera around her neck and a typical-touristy Pacsafe travel bag strapped across her chest. Without saying a word, we looked at each other and telepathically agreed that perhaps we were a bit overdressed and out of place. We looked like a couple of country club socialites trying to fit in at a Grateful Dead concert. Even though we didn’t quite blend in, we proceeded. But honestly, I don’t think anyone noticed us. Not one person gave us a second glance. They were content in their own little world—their own little piece of tranquil heaven tucked away on the outskirts of Copenhagen. One more block, one right turn, and we were on Pusher Street. Little stands were set up, kind of like a trade show, and the vendors were displaying all types of handmade jewelry, hashish and skunk weed. There are rules in Christiana forbidding “hard” drugs. The hash commerce is controversial, but since the rules require a consensus they cannot be removed unless everybody agrees. This is probably not going to happen. There were pots of green leafy plants decorating the doorstops and street corners. I don’t think it was poison ivy. We worked our way through Pusher Street in our preppy uniforms, self-conscious that we would be judged, but barely even warranting a simple glance from any of the Freetown citizens. We stumbled upon an open-air food stand and ordered two beers with leafy plants on the label. We shared a brownie. We sat down at one of the many picnic tables in the commune-style eating area, relaxed and enjoyed the view—amazingly admiring the free lifestyle and the beautiful people who call Christiana home. Music was playing. I think it might have been The Eagles. There was most definitely a peaceful, easy feeling. Christianites played chess and strummed guitars. No one was staring at a cell phone, and I doubt anyone could have told us the time of day. It didn’t matter. Amid the definite fog in the air, our minds were clear and free. It reminded me that I often work too hard, take life too seriously and rarely find time to stop and enjoy life’s simple pleasures. We would later discover Christiana is the fourth largest tourist attraction in Copenhagen (about half a million visitors annually) and has an international “brand” which boasts a progressive, liberated, culturally diverse Danish lifestyle. This special place can spark the wanderlust in us all through its sweet, warm, inviting simplicity. It is the antithesis of touristy. We could quickly see that Christiana is home to Greenlanders, musicians, street people, vagabonds, artists, intellectuals and academics. Anyone from any race, religion, creed, country, sexual orientation or socioeconomic background can find sanctuary and comfort in Freetown Christiana—even a couple of preppy Southern American girls bewildered by the beauty can find acceptance here. Yes, it was just a simple misunderstanding. I thought we were going to see the crown jewels. Instead, we took an unexpected turn onto Pusher Street and discovered a completely different kind of gem! Post script: Denmark’s crown jewels are kept in the treasure chamber in the cellar of Rosenborg Castle and in the ¨Gold Cage¨ at Amalienborg Museum. The crown jewels in Denmark are the only ones in the world that are shown as museum pieces and also worn by the country’s Queen.